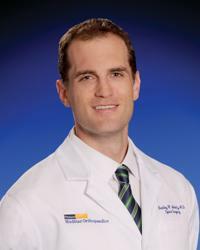 Bradley Moatz, MD, is a board-certified, fellowship trained spine surgeon. He will see patients in Ellicott City / Columbia, Hunt Valley and at MedStar Union Memorial Hospital. Dr. Moatz’s clinical interests include spinal stenosis and degenerative spine conditions. He takes great pride in restoring functional movement to his patients and improving their quality of life. Dr. Moatz, who completed one of the nation’s top-ranked spine fellowships at Emory University, is an accomplished author who has earned many academic honors. These honors include acceptance into the Alpha Omega Alpha Medical Honor Society, which indicates superior academic performance, leadership, professionalism and a firm sense of ethics, future promise, and a commitment to service during medical school. He was also inducted into the Phi Beta Kappa Honor Society as an undergraduate. Dr. Moatz’s current research includes studies on multi-level cervical discectomies and fusions and on the biomechanics of a modular nucleus replacement system. He is a member of the North American Spine Society, American Academy of Orthopaedic Surgery and Maryland Orthopaedic Association.